Core Engine is a unique mod loader for Minecraft PE & Blocklauncher offers great opportunities to play with mods and the ability to develop. It combines the loader and an extensive API which allows you to create large and complex mods (much easier and better). 1. Full compatibility of mods downloaded via Core Engine. 2. A powerful API containing 30 modules and 1.000 methods. 3. Unlimited API Technology by which mods may create much more blocks than ModPE. This is the first version of the 1.2 generation after the 1.1 that fixed most of the gameplay and API flaws, and also extended the latest update. This version completely redesigned the API for creating mobs, which makes it much faster, more convenient and more rational to create new mobs. Added 6 new APIs for working with mobs, which allow you to register, describe the appearance, behavior, drop and spawn. Fixed critical crashes and many smaller errors. Advanced config, now it has more settings. Added commands - / c log (show log), / c save debug (save and display saved data) which will help in development. Fixed appearance of items models. - Fixed critical dupe appeared in v1.16. - Fixed even more minor interface flaws after updates 1.15-1.16. - Fixed compatibility in the log. - Fixed many bugs with the new interface, optimized and cleaned the code. - Fixed a bug with objects disappearing when the player's inventory is full. Now the surplus which can not get into the inventory falls out. - Fixed a bug due to which items stacked more than 64 pieces after you get them from a crafting table. - Fixed a texture of ground covered by snow. - Fixed a bug where objects with a damage scale (charge) broke during digging or attack. - Fixed bugs with broken tools. - Fixed and optimized the main thread. - Support for MCPE versions 0.14.X. 4. Fixed the destruction of some blocks by using randomly tools. 1. Support for new versions of MinecraftPE - 0.14 - 1.0.2, the most stable version for use at the moment - MCPE 0.16.2, Blocklauncher 1.15.0.1. 2. The crafting table interface was rewritten, optimized and modified making it much more convenient to use and more similar to the original. 3. The ModPE loader system (alpha) which will download and run ModPE scripts from a special directory and correct id conflicts among themselves with Core Engine mods. 4. Improved and Fixed Unlimited API. 6. New API features: prototypes of blocks and objects as an alternative way to create them. 7. Game Object module allows you to record all prototypes of game objects, described as a set of events, functions and data, and then create their copies in the world. 8. Improved and well-optimized interface. 3. Core Engine automatically restart blocklauncher to complete the installation. 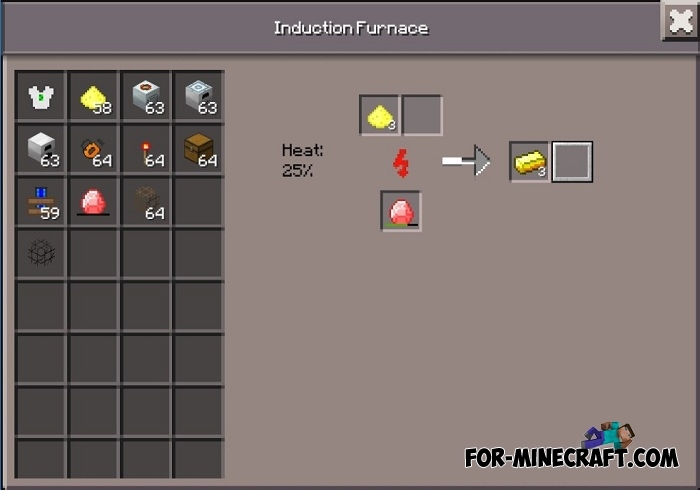 Why i cant craft the iron furnace? It requires 5 iron plates and 1 furnace but when i tap on the crafting table, i tap on the craft button but it didn't work and it still requires 5 iron plates! Mcpe 1.05 is short before release and 1.04 still crashes with it at a rate of 100%. What is bad as I have a good skyblock game what is on a dead end point without your scripts and since I have a own realm I need to use actual version of mcpe. Your script is the best on the market as far as I know, but is there a chance what you get it to work with the actual version of mcpe?